At last, I received my copy of the first issue of Sengoku Basara Magazine, which came out on 27th April 2013 for a hefty ¥2,400. It had been advertised as a publication which was sure to be prized by collectors, but I hadn't realised just how difficult it was going to be to obtain. It wouldn't be surprising to see it receive a second print run given how quickly it disappeared from online shops! Animate, e-Capcom, Amazon, HMV Japan, Rakuten and Hobby Search Japan are all out of stock, so Amazon Marketplace looks as though it's the best option for anyone still looking for a copy outside Japan. I'd better be careful to place my preorder for the second issue in plenty of time. The magazine is small by Japanese standards - about the same size as Shounen Jump, only a lot thinner at 122 pages. It comes with a Mame Sengoku Basara rubber strap featuring Date Masamune along with a special Showgeki Basara Talk! Masamune & Kojuurou No Maki Vol. 1 CD presented by Nakai Kazuya (Date Masamune) and Morikawa Toshiyuki (Katakura Kojuurou). The CD contains three skits (including a 'live' drama performance) and the opening/closing greetings from the two seiyuu. I haven't had a chance to listen yet. In terms of the magazine itself, the whole of issue one is themed around Masamune (in case that wasn't obvious from the cover). The main feature is an exclusive interview with producer Kobayashi Hiroyuki (KobaP) and director Yamamoto Makoto on the topic of Sengoku Basara 4. I've attempted to cover the interview first in as much depth as I was able to in such a short time. Please bear in mind that I am not a native speaker with a degree in Sengoku period history. In other words, I might make mistakes, and my own personal biases will affect my interpretation of the text - such as my habit of latching onto insignificant details and trying to turn them into clues. One of the most important things is that the magazine directly stated that veteran seiyuu Ikeda Shuuichi (Char Aznable from Kidou Senshi Gundam) was the narrator for the trailer and also a new cast member; even though most people have been convinced already based on his distinctive voice, I hadn't seen formal confirmation until now. KobaP refused to say whether the words Ikeda reads out in the trailer belonged to a new warrior or anything about their meaning, only stating that they were 'a character's lines'. It's possible to read into his answer two ways: he could simply have been denying that the character could be described as a bushou (a frequently-used and specific term for a military commander or warlord), not necessarily that they weren't new. Another interpretation is that the character who speaks the lines in the game is an established character rather than one of the newcomers. For the avoidance of doubt, I should note that the Sengoku Basara series often refers to all of the characters as bushou, even those who historically wouldn't have led armies or fought directly. Even I don't believe that my wild speculation will lead anywhere this time. My Emperor's final government offers this inert world up to Heaven! Hot breath! Bring about an era to suit your desires!" "Sengoku Basara 3 was set to the theme of the Battle of Sekigahara. This time, the keyword 'Sengoku Sousei' (Sengoku Creation) was chosen to give a sense of building up to the Sengoku era from the beginning. The expectation is that the story of the Sengoku period is starting anew." The other 'keyword', Shinshou Totsunyuu (Rushing into a New Chapter), isn't given any further explanation. Another thing the interview contained is the Japanese text for the final part of the teaser, which isn't shown in the trailer. This may be insignificant but it does have some deliberately unusual kanji choices for the words Ikeda speaks. Konpaku - the word I've translated as 'soul' - is most definitely not normally read as inochi ('life'). The word for 'friend' is substituted for a different character too; while it still means 'friend' it's a slightly less intimate way to describe the bond between two people, closer to the English word 'peer'. Is this a tiny hint about the speaker's relationship to the person they're addressing? I'm struggling to capture the nuance in English; for example, it could hint that they're a comrade-in-arms or a person on a similar path rather than a literal 'friend'. "Show me, my friend! The sparkle of that which you desire...the flicker of a wagered life...!" "Charm me, my friend! The sparkle of that which you desire...the flicker of a wagered soul...!" I'll summarise the other key points which may (or may not) be significant. I'm not going to translate every word of the interview as a lot of it is too vague and repeats points already made. For a word-for-word version, please purchase the magazine! 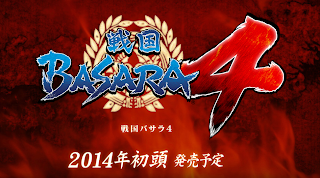 KobaP stated that work began on Sengoku Basara 4 once Sengoku Basara 3 Utage had been completed. It was decided that they'd go ahead even without a specific theme (i.e. Sekigahara in Sengoku Basara 3). On the topic of the 'Sengoku Creation' keyword, Yamamoto stated that until now, they'd been following the big events of the Sengoku period (Nobunaga, Hideyoshi, Sekigahara). How about making something based on the period itself? KobaP remarked that he didn't want to move onto the Edo period after 'finishing' the Sengoku era with the Battle of Sekigahara. Because each warrior has a different vision for the Sengoku era, they've tended to make storylines for each individual character in the past. For some characters, the events in the game actually took place at a different time, historically, or a different warlord was involved. KobaP still can't say how many characters the game will include, but he confirmed that both new and returning characters will appear (I love statements like this...). The interviewer asked whether the presence of the 'sparrows in bamboo' kamon crest in the Sengoku Basara 4 logo implied that the main character would be 'that' warrior (meaning Date Masamune, of course). KobaP joked about whether that was the case, then went on to say that there'll be a dynamic similar to the one in the third game, where Ieyasu and Mitsunari were the leads. Whether the heroes are going to be old or new characters is a secret. There won't be any major changes to the existing characters' established personalities, or younger versions. All that will change is the position they're in. In other words, just because the game setting involves the Muromachi period, it doesn't mean there'll be a younger version of Masamune. They aren't starting from scratch (the wording KobaP used was that they aren't starting from 'zero', just from 'one'). 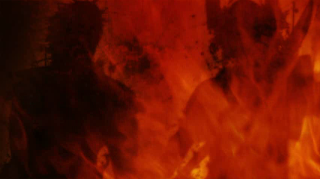 It's not going to be like Devil May Cry, where the main character was reinvented for a new series. Fans of the existing characters can expect their tussles with the newcomers to enhance what they already like about them. The Sengoku Basara series hasn't tended to worry too much about continuity, but that isn't to say that they want to ignore everything that has happened. The previous numbered games have been more like parallel worlds yet Masamune, for example, remains Masamune throughout, continuing to grow. Consequently, KobaP wants the effects of what happened in Sengoku Basara 3 to remain with that warrior. What this means is that the characters who appear in Sengoku Basara 4 might retain some of their previous relationships and experiences. The creation of an era is a major event; each warrior will have their own distinctive feelings and motivations which should come across in the story. There will be a wide range of story types, unlike with Sengoku Basara 3 which was very glum (KobaP joked that he regretted that a little). While it depends on the character, there'll be a broad selection including comedy and oudou; stories to make people cry, and stories to make them laugh out loud. Here, oudou refers to a Confucian ideal of a rightful king ruling through benevolence and righteousness - the opposite of the brute force approach taken in the Sengoku era. Yamamoto confirmed that the character Ikeda plays is not one of the two characters whose silhouettes appear in the teaser trailer. There's no 'gap' between the kind of character that fans will imagine from Ikeda's voice and what that character is going to be like. Yamamoto insisted that they weren't throwing a curveball with this hint; they deliberately picked Ikeda to match the character. However, the character wasn't made for Ikeda from the start. Their process was to first select the historical figure they wanted to include in the game, then settle on a concept for their version. They only approached Ikeda about the role after that was done. When they were working on Sengoku Basara 3, both KobaP and Yamamoto thought that the series might really end there (in other words, they hadn't been planning the scenario for this sequel back then). During development they started to have doubts that finishing the series that way was a good idea. The anime and stage play had started to run at the same time; this led to them deciding to continue with the game series, too. They didn't set Sengoku Basara 3 during Sekigahara because of their plans to end the series; rather, it was the introduction of Ishida Mitsunari which made the climactic battle inevitable. KobaP felt that Ieyasu had been wasted in the earlier games as well. In terms of other newcomers to the roster, all they can say is that there will be young characters as well. KobaP laughed and said that there'd be a large number of participants this time. Since they're starting at the beginning with the 'Sengoku Creation', there are so many historical figures to choose from across the Sengoku period that some fans will react with surprise when they're unveiled. They won't necessarily select the most famous warriors. With regards to gameplay, they're steadily adding new actions to the mechanics, but the core gameplay will remain the same. It should be viewed as an extension of the gameplay from Sengoku Basara 3. Yamamoto hopes that the theme of rushing into a new chapter will attract new players, who by now might feel alienated by the number of earlier games they've missed. He wants people to feel as though they can begin the series with Sengoku Basara 4 and immediately start to enjoy it. KobaP added that they'll get even more out of the new game if they take the opportunity to play the earlier ones while they're waiting for it to come out (he noted that all of the main games are now available on PS3, taking an opportunity to advertise mid-interview). That's the interview; what else does Sengoku Basara Magazine contain? As well as pages of fan artwork, news, merchandise information, exclusive content for the Sengoku Basara Card Heroes: Matsuri mobile game and a little survey, there are plenty of other attractions. Successful mangaka Shimotsuki Kairi provides a lovely illustration of Mitsunari with Masamune, and Tsutsumi Yoshisada has drawn Masamune in rokusou mode with lightning dancing all around him. A brief report from the Basara Matsuri 2013 ~Haru No Jin event leads into a large 'special crosstalk' interview with both seiyuu Nakai Kazuya and actor Kubota Yuuki. Since they both play Date Masamune, they're interviewed in considerable depth as a pair. Nakai says that Masamune has become an inseparable part of him, while Kubota reflects on his imminent departure from the stage play series. The two of them also fool around and pose together with swords, so it's not too depressing! The next major feature is the 'Masamune Chronicle', which tracks Masamune's appearances in each of the games, anime adaptations and major drama CDs. His famous lines and relationships with other characters are explored, as are some lesser-known facts from earlier in the series' history. Although there isn't much reason for most fans to read this section, it's fantastic for newcomers who might want to know which games cover particular clashes without playing through the lot to find out. There's a generous amount of coverage of the stage play projects in the magazine too. Butai Sengoku Basara 3 Utage is running at the moment (and there are still a few more tickets they can sell) so actors Matsuda Kenji (Matsunaga Hisahide), Kubota Yuuki (Date Masamune), Hosogai Kei (Sanada Yukimura) and Yoshida Tomokazu (Katakura Kojuurou) have all been brought together for a long round-table chat about the series. Since this play marks Hisahide's stage debut, the questions hint at how the characters might react to him in the more serious Utage stories. The actors are very funny with their candid discussions. This lengthy article is followed by a photo report and DVD review for the previous play, Butai Sengoku Basara 3 ~Setouchi Kyouran~. KobaP has a column of his own called Kobayashi HiroyukiP No Kyou Mo Basara Na Hi. He talks about how happy he is that the series has been embraced so tenderly by all kinds of fans, and how it's become a big part of his life. He wants to fill Sengoku Basara 4 with wonderful surprises and hopes he can share more of them with everyone soon. Until then, he hopes people will enjoy the upcoming Takarazuka musical and Busho Matsuri events as his 'Basara Days' continue. Three manga chapters fill out the rest of the pages. Satta Naoto's new Sengoku Basara ~Soul Revolution~ series is based on the BSR48 drama CD which came with the Sengoku Basara HD Collection game, and it's accompanied by a short article explaining the event. Next, Sumeragi's ongoing Mame Sengoku Basara (Shucchouban) manga from Dengeki Maoh/Capbon adds a touch of cuteness with a story about Masamune, Kojuurou and Itsuki. Last but not least is a 4-koma selection by artist Koutake Hiroyoshi from the Sengoku Basara Comic Anthology 'Dategun Chronicle' book which came out last month, entitled Saiki No Saki He (from Sengoku Basara 3 Utage). 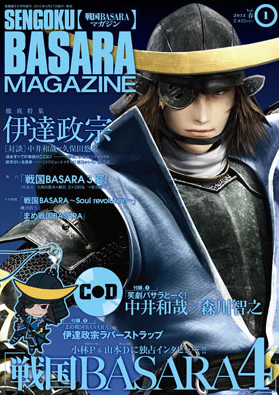 The second issue of Sengoku Basara Magazine is due for release in late July 2013 for ¥2,400. Yukimura will be the cover star and feature on his own Mame Sengoku Basara rubber strap as well as in a special chapter of the Mame Sengoku Basara (Shucchouban) manga, so it stands to reason that we can expect to see a brand new CG render of him too in the coming months. Fitting in with the focus on Yukimura, there'll be a report about the Takarazuka Sengoku Basara -Sanada Yukimura-hen- musical. The CD will be the second volume of Showgeki Basara Talk! Masamune & Kojuurou No Maki, and the Sengoku Basara ~Soul Revolution~ manga will continue. 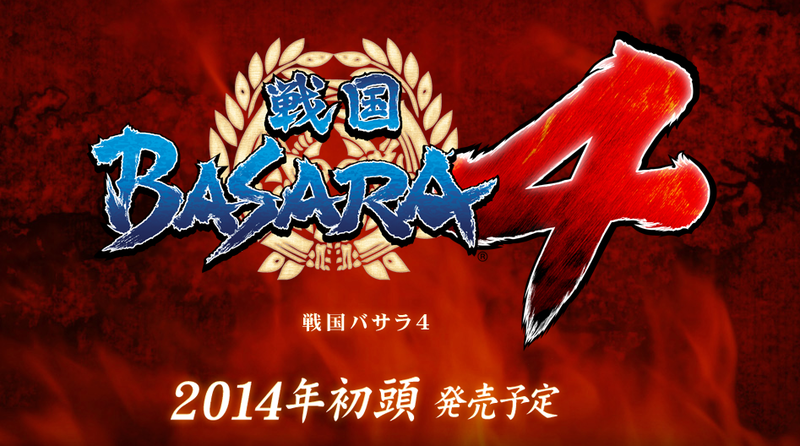 Naturally, more exclusive Sengoku Basara 4 information has also been promised. "It's possible to read into his answer two ways: he could simply have been denying that the character could be described as a bushou (a frequently-used and specific term for a military commander or warlord), not necessarily that they weren't new. Another interpretation is that the character who speaks the lines in the game is an established character rather than one of the newcomers." I don't understand what you mean by this. what kind of relation do you see between what is said in the interview and this? Hello, sorry for the delay! That part was my own guesswork, so it is not something that was actually said by YamamotoD or KobaP. It might be best not to translate it. Here is my reasoning behind it (from the end of the second page of the text). Interviewer: Is it the voice of a new warrior? KobaP: I can't say. A character's line...that's all I can say. His response uses "character" （キャラクター） instead of "warrior"（武将）, and he evades the "new" part of the question entirely. But it is entirely my own assumption, and probably not a real clue. Thanks for answering. Hmm..., well, I don't know what to think... Let's just wait to know if you're right. I know that it was your guesswork, but I'm translating your full review, except of some things.. I will link this article and say that it's your guesswork, I will put my own guesswork after the translation. Ok. I'd love to read your guesswork as well when you're finished, so I hope you'll link to your article when it's ready!